The Cairo Declaration was the outcome of the Cairo Conference in Cairo, Egypt, on November 27, 1943. 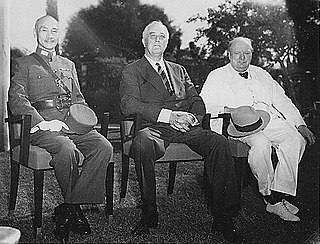 President Franklin Roosevelt of the United States, Prime Minister Winston Churchill of the United Kingdom, and Generalissimo Chiang Kai-shek of the Republic of China were present. 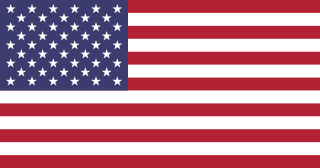 The declaration developed ideas from the 1941 Atlantic Charter, which was issued by the Allies of World War II to set goals for the post-war order. The Cairo Communiqué was broadcast through radio on December 1, 1943. The First Washington Conference, also known as the Arcadia Conference, was held in Washington, D.C., from December 22, 1941 to January 14, 1942. 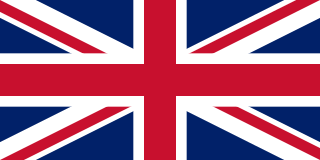 The Office of Censorship was an emergency wartime agency set up by the United States federal government on December 19, 1941 to aid in the censorship of all communications coming into and going out of the United States, including its territories and the Philippines. The efforts of the Office of Censorship to balance the protection of sensitive war related information with the constitutional freedoms of the press is considered largely successful. The agency's implementation of censorship was done primarily through a voluntary regulatory code that was willingly adopted by the press. The phrase, "loose lips sink ships" was popularized during World War II, which is a testament to the urgency Americans felt to protect information relating to the war effort. Radio broadcasts, newspapers, and newsreels were the primary ways Americans received their information about World War II and therefore were the medium most affected by the Office of Censorship code. The closure of the Office of Censorship in November 1945 corresponded with the ending of World War II. Frederick James Leathers, 1st Viscount Leathers, was a British industrialist and public servant. A summit meeting is an international meeting of heads of state or government, usually with considerable media exposure, tight security, and a prearranged agenda. 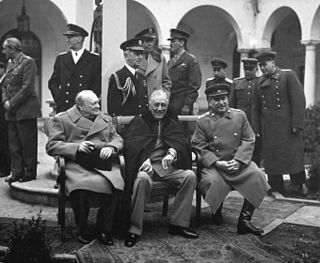 Notable summit meetings include those of Franklin D. Roosevelt, Winston Churchill, and Joseph Stalin during World War II. However, the term summit was not commonly used for such meetings until the Geneva Summit (1955). During the Cold War, when American presidents joined with Soviet or Chinese counterparts for one-on-one meetings, the media labelled the event as a "summit". 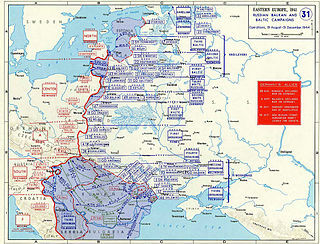 The post–Cold War era has produced an increase in the number of "summit" events. Nowadays, international summits are the most common expression for global governance. The Second Washington Conference, did not have a code name because it was hastily called and was regarded at the time as a set of military staff conversations rather than a formal conference. The two delegations were led by the British Prime Minister Winston Churchill and the American President Franklin D. Roosevelt. Deversoir Air Base (LG-209) is an active airbase of the Egyptian Air Force, known as 'Abu Sultan', located approximately 19 km south-southeast of Ismailia ; 116 km northeast of Cairo. It was formerly a major Royal Air Force airfield known as RAF Deversoir built before World War II. A helicopter unit with SA-342 Gazelle helicopters is based here.